Here are some of the most frequent questions customers have for us about skiing and snowboarding in Chile and Argentina. When is the best time to ski and snowboard in Chile and Argentina? The South American snow season begins in late June and can finish in mid October. Generally the best conditions are from late July through mid September. August is a great month to visit either Chile or Argentina. When it is blistering hot in North America, escaping to South America in August provides the perfect opportunity to cool off. The famous Santa Rosa storm generally hits sometime between the last week of August and the first 2 weeks of September. September is an excellent month to tour the Chilean volcanoes or to visit Ushuaia, which in big seasons can be skied until November. School holidays are the last 2 weeks of July and the resorts are busier during that period but there is no problem seeking out fresh tracks. Throughout the season conditions can range from big Andean powder storms to bluebird spring corn days. What is the snow like in the Andes? The Andes can get pounded with huge maritime storms coming off the Pacific, sometimes these storms leave meters of dry Andean powder for us to enjoy. Generally this type of snow settles quickly and we are able to take advantage of the vast inbound and backcountry terrain in idyllic powder conditions. The Andes are blessed with many bluebird days and great corn skiing as well. Think of the powder to be more like Alaska or the high Sierra of California. What abilities are your trips designed for? 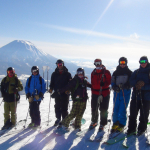 To take from the famous mountaineer, Alex Lowe, “ The best skier on the mountain is the one having the most fun.” CASA runs its tours for different abilities and the terrain of the resorts we visit allow skiers, snowboarders, and telemarkers of all levels to challenge themselves. The beauty of the Andean backcountry is how easily it is accessed from the lifts we ride. Therefore it is not difficult to split a group up for those who want to take it easy on the cruisers or those who want to send it in the off-piste. What are the lifts like in South America? There is only 1 high-speed detachable quad in all of South America, at Valle Nevado. However the lift service is quite extensive throughout the area. There are many surface lifts, pomas and tbars, (snowboarders don’t cringe), that take riders to some amazing terrain. How do we travel on tour? TCASA arranges all in country travel logistics. We pick you up at the airport and while on tour we travel in large passenger vans driven by professional South American drivers. On some of our tours we arrange plane flights to the areas we visit and will be met by our drivers. We design our travel days so the trips are broken up with activities such as visiting local wineries and artisan markets. Traveling in a group makes huge sense with gas prices close to $5 a gallon and many tolls, not to mention you can take in the scenery, doze off, and not worry about making any wrong turns. Do I need a VISA to enter Chile or Argentina? Countries outside of the EU, Switzerland, Canada and the USA may require visas. Check with the Argentine Consulate in your country for all the necessary requirements. Although no Visa is required, there is a one-time reciprocity fee for US, Australian and Canadian passport holders to enter Chile. The fee is charged at the airport upon arrival at the Chilean customs line. US and Canadian citizens must pay the $132.00 “Tourist Tax” charged at Chilean customs. Australian citizens must pay $61.00 to enter. This tax must be paid in cash in US dollars at Chilean customs upon entry. It is paid once and remains valid until the passport expires (for Americans and Canadians) and 3 months for Australians. All travelers are required to have valid passports and CASA recommends carrying a photocopy of your passport at all times. What is the best way to convert currency? ATM machines are the best way for you to access Argentine and Chilean currency. Travelers’ checks are ok to have as a backup but are sometimes difficult to exchange. ATM machines are consistently found throughout the destinations we visit and are the easiest way to access cash. Credit cards can be used at many establishments but it is a good idea to have local currency for many items. Is there Internet and smart phone access at the destinations we visit? Yes at many of the places we visit there are Internet and wireless cafes. Except for some of the really off the beaten path resorts, Internet access is reliably available. What happens if Mother Nature shuts the door and we cannot ski? Although it is very rare, sometimes there are days when the skiing is just not worth it. The lifts may be closed down to wind or a huge storm is pounding the area and visibility is absolutely nil. CASA looks to arrange alternate activities for such occurrences. We take guests to local hot springs, artisan markets, visit national parks and go hiking. South America is full of adventure; zip lining, rafting, horseback riding, and fishing can be accessed from many of the destinations we visit. Luckily we travel in small groups and can be flexible when the weather is not cooperating. Although we do not refund the money for the lift tickets on days we cannot ski, we do cover the expenses for the alternate activities we engage in. Remember there is no bad weather only bad gear!! How do I choose the best CASA trip for me? The most important choice is dependent on when you are available and for how long you can stay. Many of our trips last 8 days and are scheduled so travelers can maximize their vacation time. On our Argentina tours guests can leave on a Friday night arrive in Buenos Aires Saturday morning be in Bariloche that afternoon and return the following Sunday. 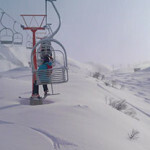 On our Chilean Classic Shortie, guests arrive in the morning and are skiing that afternoon. Guests have the following weekend to plan other activities, such as cat skiing, wine tours, or hanging in the city before heading home. For those who have more time on their hands, the Southern Cross and Endless Winter provide extended itineraries and are a great value. What is not included in the price of the tour? What are the accommodations like on tour? CASA takes great pride in searching out comfortable, unique accommodations at all the destinations we visit. From cabanas to chic apartments we use high quality lodgings that provide a great resting space after that big day on the slopes. Our prices are based on a double occupancy room and we do offer a single supplement for those who want their own space. The accommodations we choose are generally not the big package resort hotels and offer character with strategic locations. We have built many solid relationships with the accommodations we use and we believe our guests will be truly satisfied. I am a vegetarian; will I survive in South America? Yes this can be a challenge in a cuisine dominated by meat. However at all the restaurants we visit there are fish and vegetarian options available. Fruits and vegetables are readily available, but meat is certainly the dietary focus. Chilean and Argentine asados (bbqs) are world famous meat feasts and many believe Argentine beef is the best in the world. With 4000 miles of coastline, Chile serves up some delicious seafood and sushi. Argentina is known for its scrumptious mountain trout. What experience do CASA guides have? 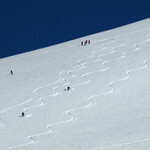 Our guides are very energetic and passionate snowlovers and travelers. They are all trained to handle medical and rescue emergencies. Our guides are certified by either US or Canadian avalanche associations. They are bilingual. They know the terrain and monitor the snowpack at the resorts we visit. They all work directly with the accommodations, transportation, and restaurant staff. We hire professional South America driving outfits. Safety is our number one priority, as long as safety is not compromised our guides are there to show you the time of your lives and handle all the logistics to make your trip hassle free. Yes, it is mandatory for all our guests to have a travel insurance plan. We recommend World Nomad’s Travel Insurance. In the unfortunate event something happens unexpectedly and you need to cancel your trip, travel insurance will cover your expenses. It covers medical expenses and evacuation costs if you become sick or injured while traveling in South America. We also recommend our guests have a homeowners or renters insurance policy. While we have experienced very little theft in the 9 years of running our trips there are always going to be dishonest people out there. For those of you who are keen backcountry enthusiasts we suggest the American Alpine Club. A $75 annual membership provides worldwide rescue insurance for accidents occurring on peaks up to 6000 meters. If you are going to be spending a lot of time in wild mountains this membership is very worth it. I have a group of friends. Can we customize our tour? Absolutely. 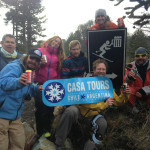 CASA has the resources and network in Chile and Argentina to run customized adventures. If you have a group of either at least 6 people or between 8-10 persons, CASA will run the trip the way you want. We can tweak our itineraries and add or eliminate different destinations. For example, many alumni have skied in the Tres Valles outside Santiago, but have not been to Portillo or Ski Arpa, we can arrange custom itineraries for your group. Also for anyone arranging a group of 10 people the 11th spot is free. I have a couple of extra days at the end of my trip, what should I do? This year CASA is proud to offer 2 different trip extensions. 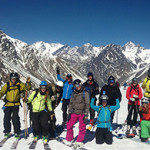 We are arranging snowcat excursions to Ski Arpa with an option to ski at Portillo. We stay at a 19th century hacienda and vineyard in the Aconcaqua Valley. Our second extension is a wine excursion through the Colchagua Valley, rated by Wine Enthusiast as the best wine region in the world in 2005. We stay at the beautiful Hotel Santa Cruz and visit some of Chile’s finest wineries such as Montes and Casa Lapostelle. Horseback riding, rafing, bicycling and trekking can also be arranged. We can also recommend hotels in Santiago and Buenos Aires for your stay before or after our tour. Want to play some golf, Santiago has some excellent courses to take advantage of. There is a service that takes golfers to private courses and provides clubs. Finish your ski trip with a round of 18 in South America.